An extremely sturdy vintage solid elm and beech original chapel chair. With a large curved top rail, distinguished shaped seat, these chairs are in excellent condition for their age, and are ideal for any kitchen, restaurant or catering use. They are in a light to medium colour, and will complement any of our pine tables. 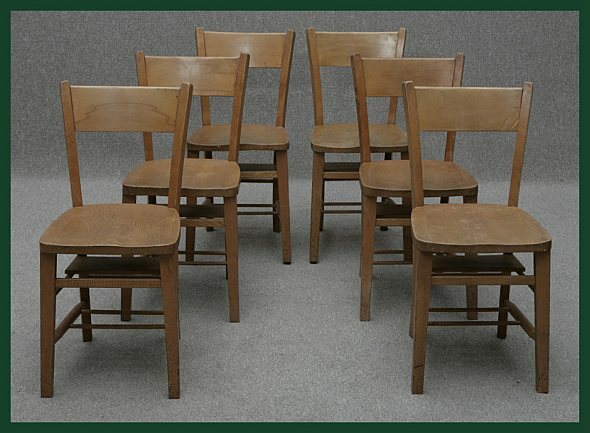 These chairs are available to purchase individually, or in sets of any quantity as we have more available. These chairs are being sold as seen. There may be marks, blemishes, scratches etc. They are all usable, but may need some attention (polishing for example) before using.